La recherche de ce lieu privilégié pour faire de vos vacances un séjour que vous ne serez jamais oublier? Vous l'avez trouvé! Heron's Perch, niché entre les meilleurs de la rivière Atlantique et de la pittoresque rivière LaHave, est l'endroit idéal pour passer des vacances merveilleuses et paisibles. Au cœur du comté de Lunenburg, il est parfait pour la détente, les randonneurs, les explorateurs, les écrivains, les artistes, les ornithologues, les naturalistes et les historiens. Cette maison est idéale pour les familles qui veulent explorer et découvrir ce que la Nouvelle-Écosse a à offrir sur la Rive-Sud et revenir ensuite à une retraite paisible. Cette belle maison rénovée de 100 ans, avec ses chambres spacieuses, ses planchers / moulures en bois franc, ses fenêtres lumineuses et ses plafonds en tôle. 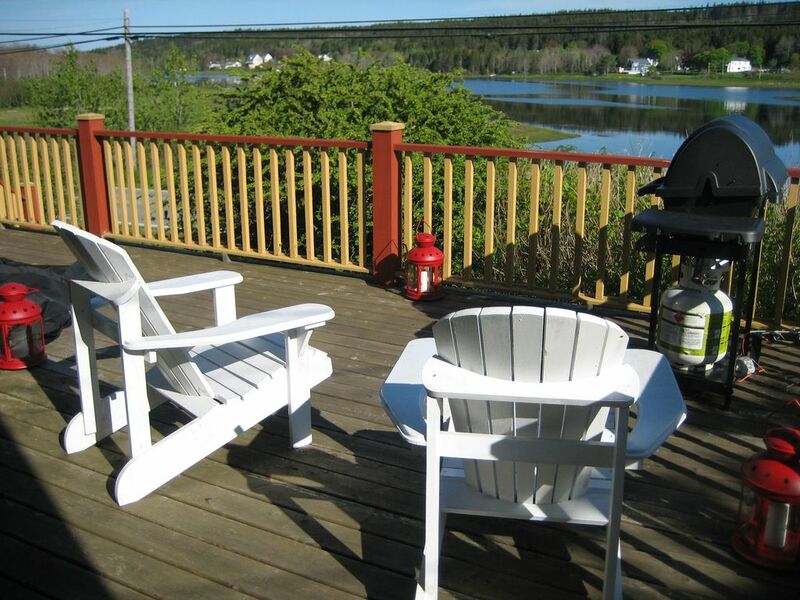 Une grande terrasse se trouve dans la cuisine et est parfaite pour profiter d’un barbecue, ou simplement pour profiter de la paix et de la tranquillité tout en admirant les eaux calmes de Ritcey’s Cove, dans le petit village de Riverport. Perch Heron animaux de compagnie. La chambre principale spacieuse, avec une vue magnifique de l'eau, a un lit queen et un lit belle journée qui peut être utilisé comme un lit supplémentaire ou deux lits simples. Il dispose également d'un grand walk-in. La grande deuxième chambre, avec une vue sur l'eau, dispose de deux lits simples. La cuisine est un délice avec des appareils modernes et une gamme complète d'équipements pour la préparation des repas. Prenez un tabouret à la barre de petit déjeuner ou de sortir sur le pont. Profitez de vos repas avec la famille dans la pleine grandeur historique salle à manger. La salle à manger ouvre sur le confort de la salle à manger familiale où toute la famille peut regarder un film ou jouer à un jeu de société en famille sur un jour de pluie. Wonderful historic home full of character. Comfortable and spacious. Great for families. Excellent location for relaxing and visiting everything the South Shore has to offer. Great location - very clean! My family and I spent 7 days at Heron’s Perch. When we first arrived in Riverport we got lost. It was late, everyone was exhausted but we called Keira and she guided us back. We were so grateful! The house was very clean, beds were extremely comfortable. The bbq was not working when we arrived, but it was replaced with a new bbq immediately. Although the house didn’t have air conditioning, the fans provided on the 2nd level helped. Heron’s Perch is in a great location, away from the the busy towns of Mahone Bay and Lunenburg but close enough to travel to within 20 minutes. Everyone must visit the popular Hirtle beach which is less than a 10 minute drive from the house. We’ll definitely be back. Thanks for the great hospitality! We were pleasantly surprised when we arrived at the house, stepping through the door made us feel home and already relaxed. The house is tastefully decorated and extrudes the charm of years gone by combined with modern amenities like fast internet. The location is quiet, even though the road is there, there is very little traffic. The view across the water invited us to sit on the porch in the evenings. Overall location is perfect, it's quiet but very close to Lunenburg with its restaurants, shop, and museum. Halifax is an easy drive too. There are good beaches either a 10min walk or a short drive and a lot of wildlife, seals, birds, fish and even a shark right in front of the house. We spent a week at the end of June at Heron's Perch. Best thing about this rental is its location - away from the bustling tourism of Lunenburg but yet close enough to go there easily. The local area is also lovely and great for walks and cycling. We did a lot of exploring of the local nooks and crannies. Summer 2018 road construction means a significant detour if you want to go to La Have Bakery - but the detour is totally worth it. Great place for lunch, and cute art boutiques across the road. We stocked up on a few frozen dinners from the La Have Bakery - all were delicious. Crescent Beach a bit further down the road is worth a visit, as are the La Have Islands and Rissers' Beach. Also a cute ice cream/food shop in East Dublin. The outside of Riverport House needs some good TLC but inside it's been fixed up and has all the conveniences you could wish for in a vacation rental. Whimsical touches are spread throughout - we especially liked the various quilts. It's a big, rambly house with lots of space to spread out. Being an older house, some of the windows and doors are sticky and you will likely find the need to use the fans on hot days. You will also likely want to stock up on water jugs (we used 4 4-liter jugs during our week) as the water should otherwise be boiled before using. Tips: 1) bring an HDMI connector for the TV as it does not have cable...that way you can livestream news or other shows from your laptop. 2) if you're coming in summer/fall 2018: as you approach Riverport from hwy 332 coming from Lunenburg - disregard the sign that says "332 detour" and would have you turn right onto Indianpath road. Recommendation to owners: a sun umbrella over the dining table on the patio would be great for those sunny days! We LOVED Riverport house. The listing is accurate and helpful, the home was clean and HUGE but cozy. I really hope to go back. I have never stayed in a vacation rental that had such a well stocked kitchen including condiments, spices, oil, etc. The views are stunning and the old historic home is so charming. We loved Lunenburg, Crescent Beach, LaHave, Rose Bay, Peggy's Cover, Halifax, and just walking around Riverport. Check out the Rose Bay general store (5 minute drive) for the cutest store you've ever seen with a great wine and beer selection, food, and anything else you may have forgotten to get in the bigger cities. Lunenburg was a great day tip (about 20 minute drive). We enjoyed cooking at Riverport House and enjoying time as a family! There were games, jigsaw puzzles, movies. Overall I would recommend if you want to connect with your family and be in a quiet, historic location just a short drive to all the South Shore attractions. Once we have received the completed Rental Agreement, we will process your deposit and email you a confirmation receipt. We will send you details explaining when the final payment is due. Once the final payment has been made we will send you all the details you will need including driving directions, house rules, and instructions on where to find the key.